Recently my wife and I went to Stockholm, Sweden. We were there, accidentally, for 2 weeks in total. For the first 2 days we wandered around and tried to battle jet-lag through a healthy regiment of walking in the sunlight with frequent stops to consume cappuccinos. Following that, I had a week long convention while Dawn did whatever suited her at the time. 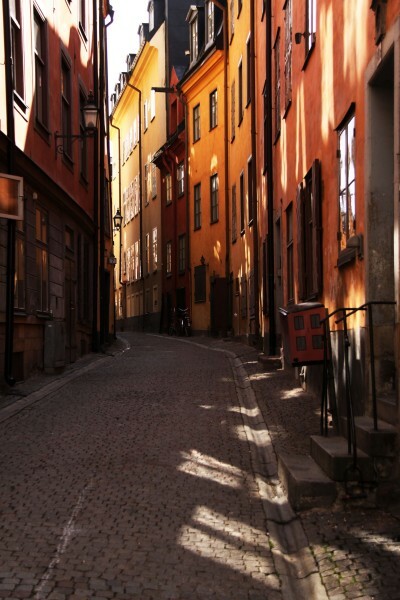 Our first major outing was to the island of Gamla Stan, which is one of the oldest parts of Stockholm. It’s narrow streets are filled with stores, restaurants and brightly colored walls. It’s an extremely relaxing area of the city to walk around that is devoid of cars and full of things to feed your eyes. There are, especially in the summer, a huge number of tourists so the streets are crowded but it’s worth it. The Stockholm guidebooks we looked at mentioned pick pockets but we felt much safer in Stockholm than many other large European cities. During my working-week we did get to spend an evening at the wonderful Vasa museum. 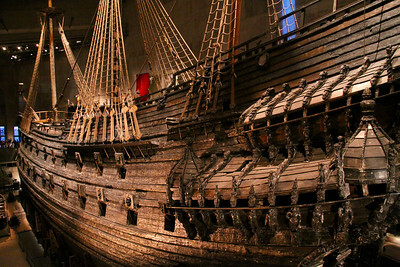 This museum is dedicated to a huge wooden war ship which sank in 1628 and was recovered in 1961. It’s a wonderfully done museum dedicated to a ship that is stunning to walk around. Though it does feel odd to visit a museum entirely dedicated to a ship that failed so dramatically: it sunk only a few minutes into its maiden voyage. The museum is on the “must see” list if you ever plan to visit Stockholm. After these first few wonderful days of touring the city we were emailed by our currently preferred credit card company (thank goodness for conference internet access!) that we needed to contact their fraud department ASAP and they had deactivated our card. After calling, we learned that they suspected something was wrong. They asked us if we had purchased plane tickets recently. Certainly, we assured them, we had. Also, did we purchase anything from overstock.com on July 24th. Well it so happens that was the day we were travelling (and travelling and travelling), so we certainly hadn’t. They immediately cancelled our cards and promised to send new ones to our hotel and they “should hopefully get there by Saturday”. This was a good thing as we were set to check out on Sunday. We had a wonderful last day in Stockholm on Saturday visiting some of the museums that we hadn’t seen yet. The Nordic and historical museums are well worth visiting in Stockholm. The historical museum in particular goes into great depth about the fascinating Viking history in wonderful detail. That evening we returned to the hotel and were told by the front desk that, sorry, but we hadn’t received a package. Oh uh, we thought. Now what. Our only choice was to stay longer and wait for it. So much for our “last day”. Fortunately, they had enough room that we could stay until Monday if we liked while we were waiting “our package” (we of course didn’t admit we were waiting for cards to pay them with). So much for our plans to see the south of Sweden. So we spent another wonderful “last day” on Sunday visiting Skansen, which is an outdoor museum of Swedish historical architecture and culture. In a large open space on the top of a hill in an island with a beautiful view of the water around Stockholm, they brought in houses and buildings from around Sweden from various time periods and let visitors walk around and through them. It is an absolutely fascinating area that we spent over 10 hours in before giving up and realizing we couldn’t see every possible structure and animal (but we still felt good about getting to 90% of them or so). The next day, Monday, we slept in after our 10+ hour walk. Around 11:00 (an hour before checkout time) we checked with the front desk and they informed us “no package; yes you can stay until tomorrow”. Then we brain stormed. What now? Well, we hadn’t yet taken a boat cruise through the city, so… let’s do that. We opted, after pouring over brochures, to forget the simple cruise around the city and go all out for our “3rd last day”. We signed up for an all day boat cruise for the day after that would take us through some of the neighbouring islands. And yes, we could stay until Wednesday since the all-day Tuesday trip would ruin our chances of checking out on Tuesday. And yes, they could add the boat trip tickets to our hotel room bill. Excellent, I thought while slyly trying to glance through the kitchen doors to see how many dishes we’d be able to wash in order to pay the upcoming larger and larger bill without a credit card. The boat cruise was fantastic. Just off the coast of Stockholm are 30,000 archipelago (small islands for those of you with a vocabulary similar to mine). The boat cruise took us around and through a gazillion of them and dropped us of for an hour on three of them. Each were different, the final including a cute village with brightly colored houses. All red. My favorite of the three islands, though, was the most remote, desolate, rocky island. I could have spent a full day on that small island walking across the barren terrain through the fog. Upon arriving back at the hotel that evening we, of course, found no package waiting for us at the front desk. We called the bank again and they apologized profusely and explained that they couldn’t even find a tracking number for the package they had sent. They were deeply concerned about this and would look into it. Now, I don’t want to say anything particularly negative or positive about the bank in question. It’s probably not even worth naming them. On the plus side, they were extremely courteous (of course) on the phone. But, on the down side they did fail to get us new cards within even 5 days. They’re on par for the typical banks in the U.S. of America. We learned one important lesson during the trip: always carry two credit cards. Of course we always knew you should do this, but now we really understood why. I think this is the first trip we hadn’t taken two and naturally it was the first one where we needed two. At least we had an ATM card (which is also supposed to work as a visa but never seems to act that way consistently). Next time we’ll certainly take a back up. We’ve learned. If there is one thing I’ve learned from travelling: you need to roll with the punches. Almost no trip goes perfectly (oh the stories I could tell about just airports!). When travelling, if you spend all your time just fighting the good fight, you’ll have a lousy vacation. In the end the bank informed us that we could ask the front desk to charge the bill to our old credit card and it would fail. Then we could call the bank and they would authorize the next charge of that amount and it would succeed the second time. Now, when you go to the front desk of a hotel that you’ve just spent two expensive weeks at and tell them to “try this card but it’ll probably fail” you should have a camera ready to capture their expression. It’ll be priceless. But the process did work as expected and I’ll now quote the receptionist after the second charge succeeded: “Yessssss!” (while throwing a fist in the air). All in all, Stockholm is a wonderful city to visit. There is more to see and do than you can fit into even two weeks, as it turned out. And if you have to get stuck in a city, it’s a good one to pick to be stuck in. My wife summed up Stockholm wonderfully: it isn’t Paris, but it’s definitely right underneath it as good places to visit.